Columbia Men's Bahama™ Vent Loco II PFG Shoes are lightweight and drainable boat shoes designed for great traction on the deck or land. 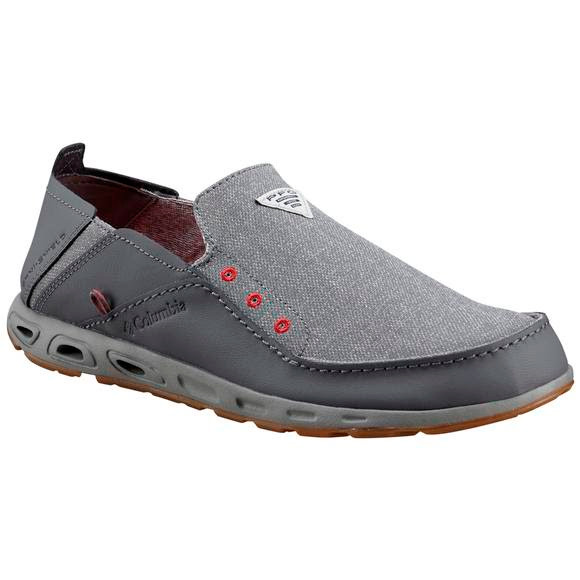 Columbia Men&apos;s Bahama™ Vent Loco II PFG Shoes are lightweight and drainable boat shoes designed for great traction on the deck or land. Techlite delivers superior comfort and cushioning for outdoor footwear. This durable, impact absorbing material delivers consistent support in a lightweight package to keep feet protected and comfortable whether at the beach or on the trail. Techlite cleans easily with soap and water, is non-marking, odor-resistant and easy on the environment. Specifically formulated to provide two lines of defense to prevent and remove stains. Omni-Grip provides the right grip for every environment. Columbia designed advanced traction solutions for the trail, hiking, winter, and water in order to ensure outdoor stability, no matter where your adventures take you. Multidirectional digging zones in their trail footwear promote scrambling and acceleration. A dual-zone winter tread pattern ensures solid footing on packed snow or ice and soft, slushy snow or powder. Hiking traction is designed to grip loose dirt and gravel combined with a durable and rugged perimeter for weighted packing. The water traction treatment features two zones with siping (small cuts that help move water out from under the shoe) for traction on wet surfaces and a perimeter design for a stable stride on solid ground. Hold tight on any terrain.